Recently, I worked on a Service Fabric solution for a customer, where my team had to configure secure communication capabilities to existing reliable (stateless) services, built on top of the ASP.NET Core 2.0 framework. More specifically, we had to configure the Windows Authentication feature on them and choose WebListener as the web server, to process HTTP requests from remote Windows clients. We’ll see that there are slight differences in the names of some ASP.NET packages and libraries, and in the way we configure a weblistener on a stateless service, with the latest version of ASP.NET, with respect to the previous versions (1.x). This article will highlight these aspects and describe a way to properly configure a Service Fabric (SF) Reliable Service Stateless Service, given these requisites. We will leverage on the features, improvements and support made available by the latest release of Service Fabric SDK for Windows (v5.7.198). ASP.NET Core 2.0 Support: the Microsoft.ServiceFabric.AspNetCore. 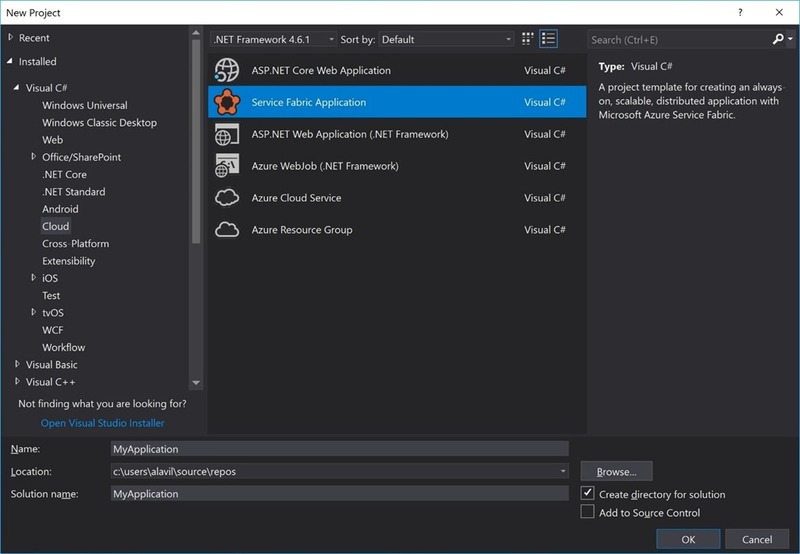 * NuGet packages now support ASP.NET Core 2.0, the latest major version of the open-source and cross-platform framework for building modern cloud-ready web applications. For a fully-documented release notes page, please visit the Azure Service Fabric Team Blog. 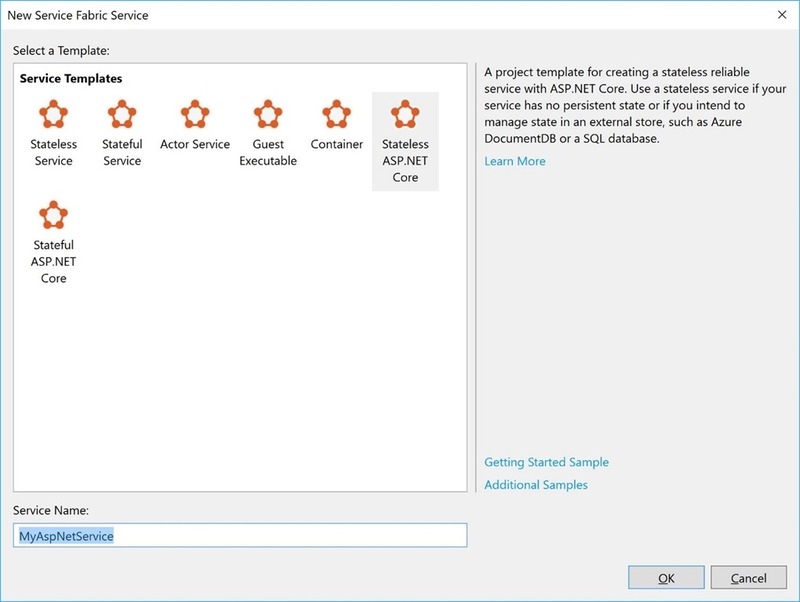 In the following section, we’ll be building a simple ASP.NET Core 2.0 application, packaged as Stateless Service, using the Stateless ASP.NET Core project template provided by Visual Studio. We’ll then configure security on the application to perform Windows-authenticated calls. 1. Open Visual Studio as Administrator. 2. Create a Service Fabric application, name it MyApplication. 3. 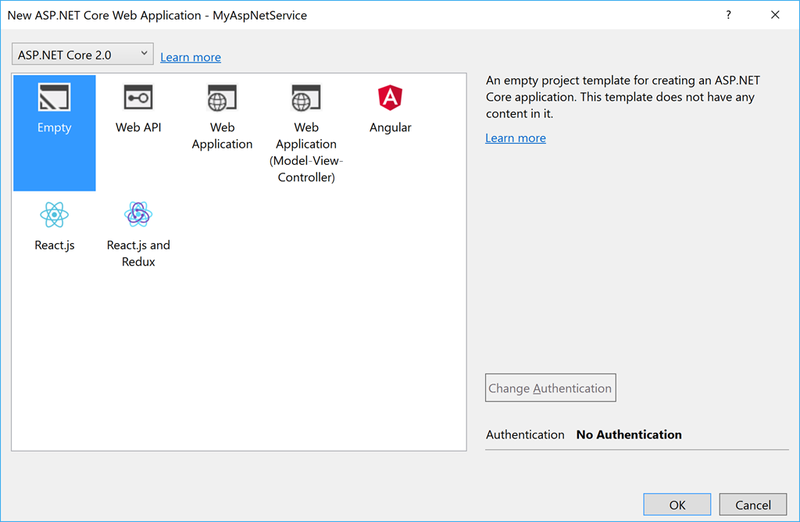 Create a Stateless ASP.NET Core Service, name it MyAspNetService. 4. Make sure you select ASP.NET Core 2.0 in the following dialog. For this example, I used Empty project template and No Authentication as authentication method (we’ll set it programmatically). Wait until Visual Studio has set up either the application and the service projects, then navigate to MyAspNetService.cs file, which contains the class representing the SF Stateless Service used for our purposes. As you can see, a communication listener based on Kestrel has already been set up as default listener for the only service endpoint configured (ServiceEndpoint). ASP.NET Core comes with two server implementations, briefly explained below. We chose WebListener as web server, since it supports Windows Authentication. Kestrel is a cross-platform HTTP server based on libuv library, for asynchronous I/O operations on cross-platform architectures. As previously shown, Kestrel is the web server that is included by default in ASP.NET Core new project templates. WebListener is a Windows-only HTTP server, based on the Http.Sys kernel mode driver. Learn more about WebListener web server implementation in ASP.NET Core. The packages Microsoft.AspNetCore.Server.WebListener and Microsoft.Net.Http.Server have been merged into the aforementioned new package Microsoft.AspNetCore.Server.HttpSys. The namespaces have been updated to match. This is reflected in calling UseHttpSys() extension method instead of UseWebListener(). Learn more about HTTP.sys web server implementation in ASP.NET Core. Once you publish the application, and the service instance(s) is up and running in your local cluster environment, you can simulate HTTP requests towards the endpoint configured in the ServiceManifest.xml of the service project (in my example, http://localhost:8234). <!-- This is the name of your ServiceType.